Like manna from heaven if you’re into the tailoring thing. It’s been said before that this pattern is worth its weight in gold purely for the 4 bits of paper that come with, and I honestly couldn’t agree more. If I were to make another of this from scratch and following the word to the letter, I would still learn something new. You have the option of using couture techniques, or the quicker route of using ready-to-wear techniques. I made View A (couture) instead of View B (RTW), which uses horse hair canvas at the front and silk organza as underlining everywhere else. My fabric was loosely woven so I interfaced all the pieces with a really lightweight fusible to keep the tears to a minimum. 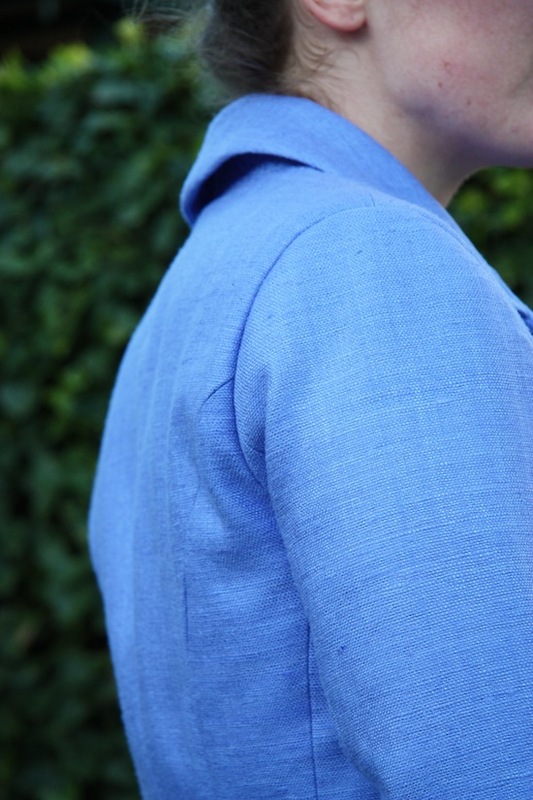 Sewing a notched collar shouldn’t be this easy. But it really is! I also love that the collar is made up of three pieces – a stand, upper and under collar. The latter is cut on the bias and shaped so that when you turn it out, the seam line is just ever so slightly on the underside, rather than on the fold so it’s visible. I think the term is ‘allowing for turn of cloth’?. It’s not often I thrown on a jacket and have an instantly defined waist. Kudos to Claire for making a pattern that flatters one of my favourite sections of the female physique. I had bought enough fabric to make a matching skirt… but really I’m loving this as a weekend thing with jeans. My jacket from The Vogue Suit gets a lot of wear this way too (in fact, it’s easily the most worn item I’ve sewn yet), so now I can spread the wardrobe workload a bit. Maybe this doesn’t quite deserve to be included in my favourite things. There’s something amiss with my technique because my buttonholes don’t look like Jeffery’s, Marina’s or Paco’s. But they have shred apart my belief that couture = fragile. You could launch a rocket through those button holes and have them hold. They ain’t going nowhere! Fabric – Periwinkle Blue woven raw silk tussah from EmmaOneSock, and lemon yellow silk satin lining from Clegs. Inside you’ll find horsehair canvas, silk organza, nylon fusible interfacing and a truckload of hand stitching. Buttons – in self covered fabric from Buttonmania. Click here for hand worked buttonhole resources like gimp and silk buttonhole twist. Why the GGQB acronym you ask? It stands for Governor General Quentin Bryce – my inspiration for both the fabric colour and the style. What a woman. There was only one part in the instructions that left me a little confused – where you are required to ‘tape the front’. It doesn’t specify what kind of tape one should be using. Thankfully, Claire also talks about this in her Couture Sewing book, where she said she uses strips of silk organza. So that’s exactly what I did (you can see my ‘immaculate’ fell stitching, pad stitching and tape application here). The only other thing is that there’s no telling when you’re supposed to remove the basting stitches. But hey, it’s hardly a life changing decision! 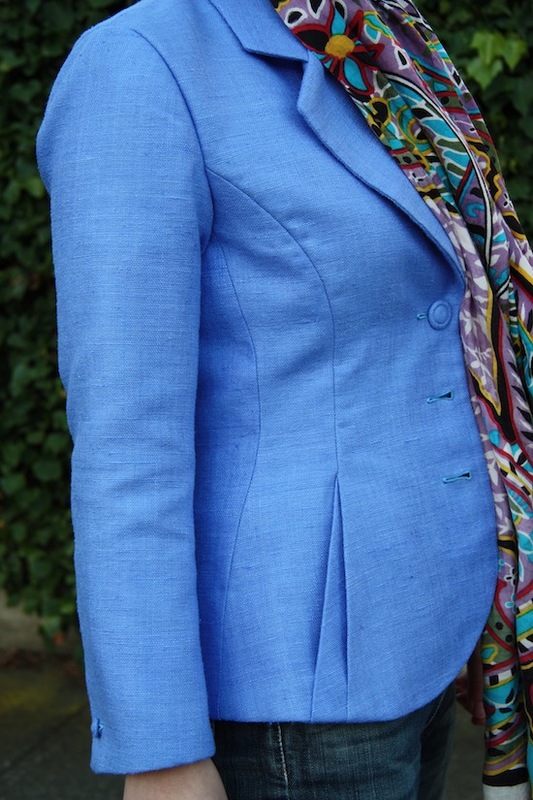 My love of both wearing and making tailored jackets is well set to continue… I’ve already got the fabric and the pattern for my next tailoring project-to-be safely stashed away! I completely forgot to include some shots of the lining (click to enlarge), which is a requirement of the competition rules. So yay for more photos! Vote! Plus Patterns and Postcards! Wow Melanie, this is beautiful. It turned out amazing! The construction, the attention to detail, everything about it is fantastic. Great job and good luck with the competition! Fingers crossed. This is just gorgeous. I adore this pattern but don't think I'm quite 'there' in terms of skills. Fabulous job and beautiful colour. Quentin would be impressed! Absolutely in awe of your sewing skills – what an amazing jacket. BTW great coloured scarf! !Good luck in the competition – you've put so much work into this jacket. Love it!!! You've got my vote – this is incredible! How did you find the fit? Did you have to do much adjusting of your muslin? You've really inspired me. Stunning! Beautiful work – lovely style – great colour. Great job. love how the jacket turned out! i'm sure you see every flaw, but i think your buttonholes look great. i may have to pick up this pattern for the directions alone. amazing job! Wow, that looks great. Very impressive. This is great! I've been looking for a jacket pattern to try out too so I like that you noted it has couture and rtw options. And it's on sale right now! What a great jacket! Such a fantastic job. I think I need to add this pattern and book to my list now. The colour is stunning and perfect for spring. What a great style icon as well. A women who knows what she likes and how to make it work for her. Also how to be a leader while still maintaining her femininity. Lots of respect for Quentin. Wow- those front details are so gorgeous. Just beautiful. What a beautiful jacket!! Extremely well done. I'll be sure to stop by PR to cast my vote. This was the first Claire pattern I purchased (I agree – the instructions alone are worth the purchase so, I often grab them when I find them) but, I've been a bit nervous to try it. You make it sound so easy though, I may just have to have a go at it this fall. Um, more than worthy! This is beautiful. I love the texture of the fabric. And I just don't know what to say about the buttonholes. They look amazing. Argh, I want one so much! So cute and love the color! 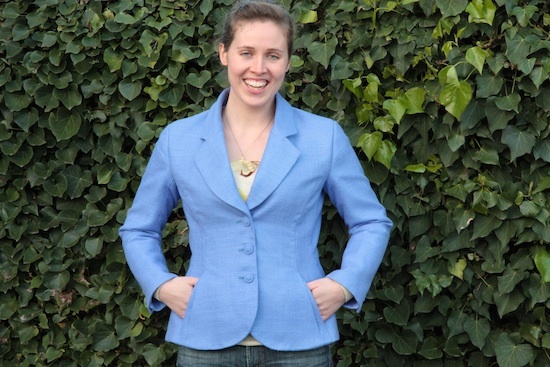 New goal for self: improve sewing skills and make my own jacket in a fun color!! Your jacket is divine, you've done a beautiful job! What an amazing jacket. I am in awe of your sewing skills. Wow! How long do you think it took all up to make? The detailing is really beautiful. That colour is just so you. Bravo! It looks amazing. And the periwinkle blue colour is both pretty and flattering on you. All the details are spot on. Good luck in the contest! Beautiful. You've got my vote – there are so many lovely details. I have to agree that out GG is one very stylish and impressive woman and I love that you've named your jacket after her. Lovely work!!! Very Quentin :) I'm off to vote for you now. That jacket looks meticulous and the colour could not be better on you…. 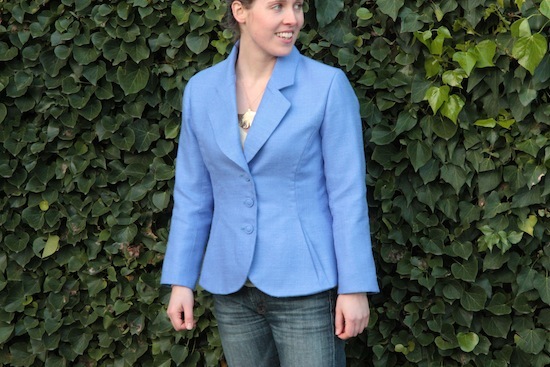 Going to bookmark this post for inspiration when I get around to tailoring a jacket this fall! 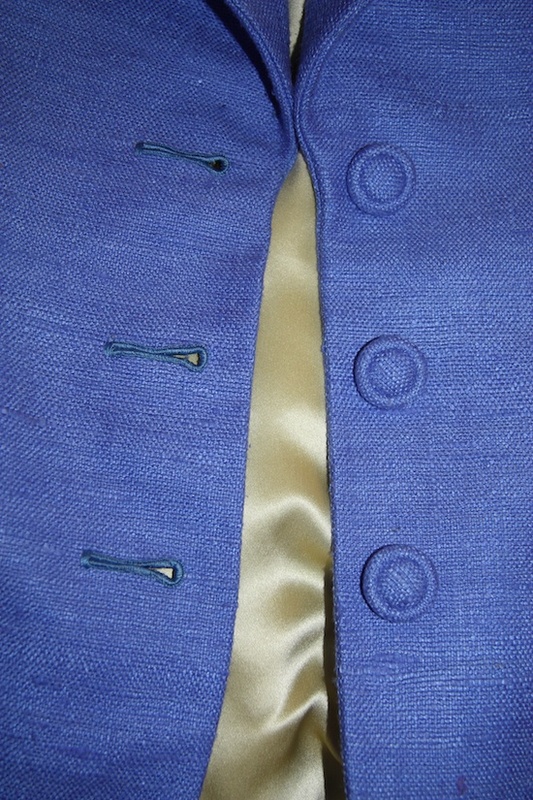 Those buttons and buttonholes are amazing! Very admirable indeed. Your jacket is gorgeous. The color and fit is so flattering on you! Great job! Wow! Just beautiful! I'm so in awe of your beautiful couture jacket. All your posts recently have got me itching to work on something meticulous and tailored myself! This is just beautiful! I love all the details and your fabric shows them all to perfection. 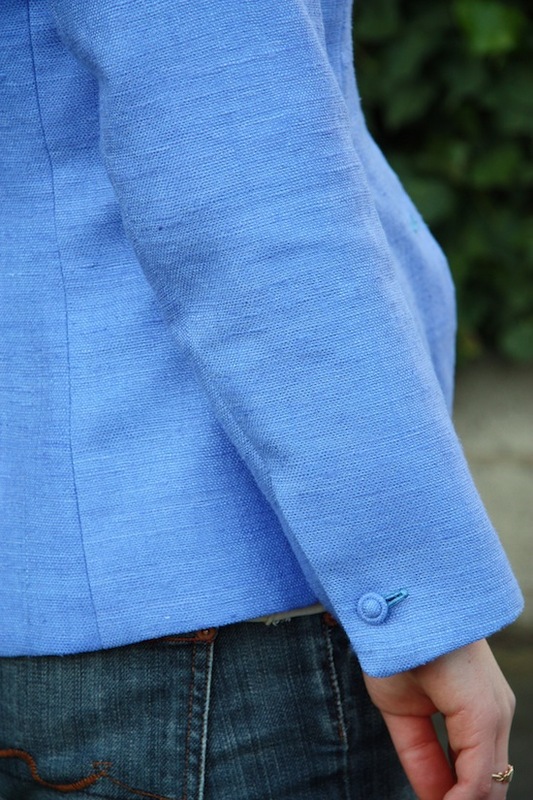 Kudos on your buttonholes. They're a little bit awkward at first, but, yes, they are definitely not fragile! Great job! Thanks Lizzy – I'd like to think so! Yup that scarf is one of my current favourites :) Thanks Evelyne! I couldn't recommend the pattern enough Lisa. Thankyou! Yep, we're all Team Quentin here. 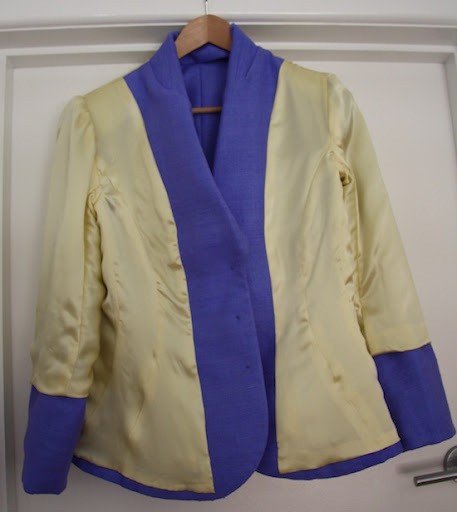 I only need to make something to go with this jacket now… the colour of it doesn't suit any of my pants. Not that I'm complaining – any excuse to sew! Thanks Jennifer – you should definitely try it. Seriously you have your hand held the whole way though :) which makes things much easier! Because you're worth it :) Do it! Just under a month cumulatively… but probably upwards of 40 hours time wise I think. A fair while, either which way! Thanks so much Robyn :) She's a big inspiration for me! Thanks Tia! I'm going to keep on trucking with those buttonholes. I will absolutely perfect them… one day! You always come up with great stuff Poppykettle. I don't know how you manage to do it so quickly whilst working full time. Keep it up, I love reading your blog! Beautiful work as always Mel! You are becoming quite the couture master! This is so beautiful! I absolutely love it! Great job, girl! Wow! you are a magician, just beautiful. I am in awe of your talent. 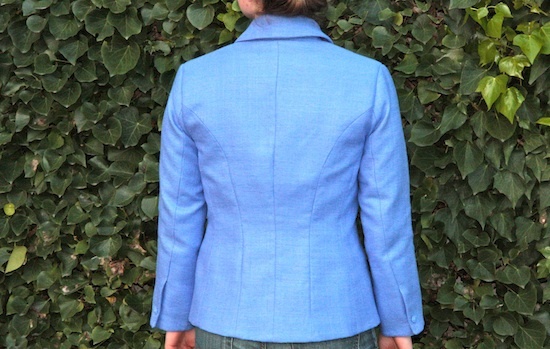 Beautiful jacket, beautiful colour and beautifully fitted -you are bound to win ! Amaaaazing. As ever, I am very impressed. What a wonderful jacket. The colour is perfect for you. Great instructions are worth their weight in gold. I'm so very very impressed with your buttons. Thumbs up for a job well done. Lady! You are amazing, yes indeed. I'm mulling over a cropped velvet jacket with ribbon embroidery right now. I've decided jackets are definitely lacking in my wardrobe and I want a full range of casual to elegant Chanel. I have this pattern, so I think I'm going to add it to my list of 'wardrobe staples'. Wow x 50. That's a great jacket! Love the design, color, fit, all of it. And I'm impressed that you followed the couture directions. I've seen those vogue patterns before that offer couture vs RTW construction but I've never taken the time to make one couture style. I like that your jacket is great for work and also for weekend! Love it!!! Your blazer is amazing!!!! Great job Melanie. Have you checked out the Tessuti Awards page recently? With your talent, you should really consider entering? 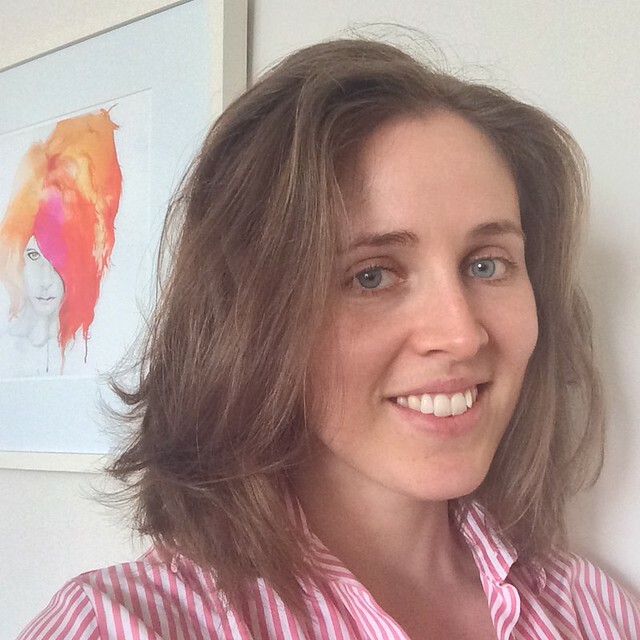 I did use your posts as reference reading… one of my favourite things about the sewing blogosphere is looking at how others approached a pattern. And thank you! Thanks for your vote of confidence Janine! Unfortunately not… but I don't mind coming in behind the jackets that did – they were stunning and incredibly well made! Thanks Lara :) I hope you do! Beautifully made- just stunning and those buttonholes are PERFECT! I voted for you my dear! I just found your blog this morning. I am very impressed with your jacket. You did a marvelous job. I have this pattern in my stash just waiting. I hope I have as much success with my jacket. Gorgeous!! I am pinning this post (just in case I ever get around to making my CS patterns). 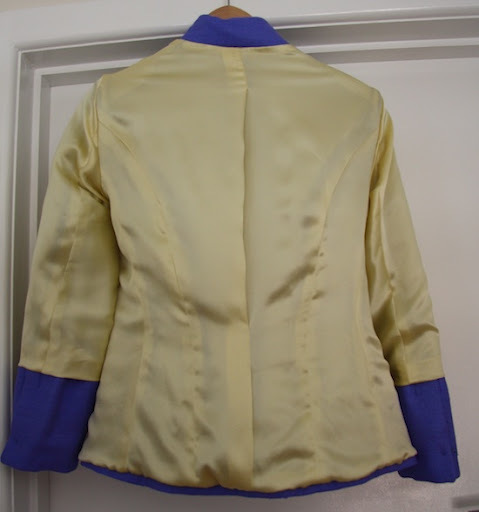 This jacket came out great I had a lot of problems understanding the pleat though :-( Can you assist I have another I want to make..
Wow, this looks wonderful! I’m attempting to make this jacket (version b, I’m something of a sewing novice) and I have just completed my first muslin only to find that the fit of the armpits is far to large to overlook. The fit of your jacket looks stunning. Did you make any alterations to the fit? ;9 you have any experience with bringing armholes up when they fit too low?